The Volume Oscillator (VO) identifies trends in volume using a two moving average system. The Volume Oscillator measures the difference between a faster and slower moving average (MA). If the fast MA is above the slow MA the oscillator will be positive. If the fast MA is below the slow MA then the oscillator will be negative. The Volume Oscillator will be zero when the two MA's cross. Rising volume (positive VO) signals a strong trend. Falling volume (negative VO) indicates trend weakness. 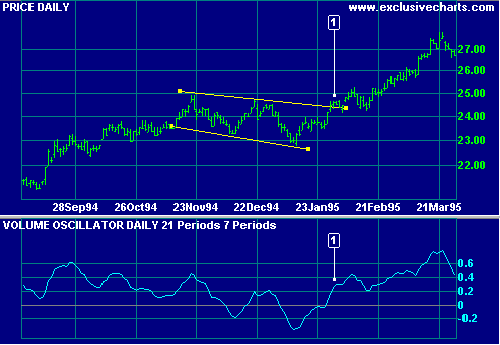 Coca Cola Corporation with Volume Oscillator. Price forms a flag pattern after a strong up-trend. Volume declines on each trough and rises on each peak, suggesting an upward breakout. The breakout above the resistance line is then confirmed by a sharp rise in volume. To alter the default settings - Edit Indicator Settings.